What BCM 200 or 400 software release do I have? BCM 200 & 400 can use two different client-based management applications. Unified Manager for early releases and Element Manager for releases after January 2007. You can only find the BCM software version via a PC. If your BCM uses Unified Manager then find our Unified Manager FAQs. 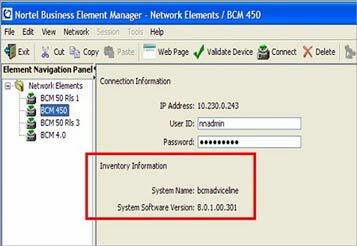 When you open the Element Manager application the software version will appear as Inventory information prior to connecting to the BCM system. It will be in a format similar to 8.0.1.00.301 – look this up in the table below to find the release number. There may be a shortcut icon on your Desktop or it may have been saved in your favourites. Alternatively type the IP address of the BCM in the address bar of your browser. If the BCM is connected via a LAN, enter the IP address that was allocated to the BCM on installation. If the Application Launcher appears, you have a later release of BCM. In this case, from the Application launcher click and open BCM Element Manager or Administration applicationsand then Documentation. 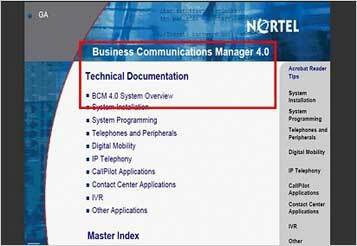 In either case, the documentation web page will open and display the Software version of the BCM system. Which BCM (Business Comunications Manager) do I have? How do I find the BCM software release using Unified Manager?